January 18th, 2015. Category: Uncategorized. Next week will be a momentous one for Europe. On January 22nd the European Central Bank (ECB) is expected to start the e-printing presses rolling with a massive Quantitative Easing (QE) programme to attempt to tackle stagnation and deflation in the Eurozone. Then on January 25th Greece goes to the polls and if, as expected, the left wing Syriza party gets the majority of votes, a fundamental challenge to the disastrous Europe-wide austerity programme will follow. 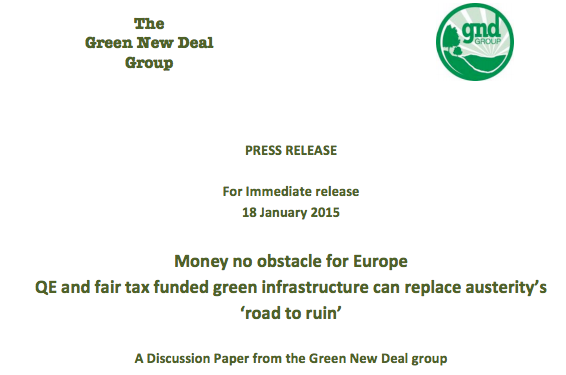 The Green New Deal group’s paper ‘Europe’s Choice – How Green QE and Fairer Taxes Can Replace Austerity’ asserts that an ECB QE programme to buy government bonds will, like it’s £375 billion UK predecessor, do little to increase economic activity, and will merely boost asset prices rather than generate sustainable jobs throughout the continent. Instead the Green New Deal Group proposes that all EU countries introduce a programme of ‘Green Infrastructure QE’ to increase the continent’s renewable energy supplies, ensure all buildings are energy efficient and revitalise local and regional transport links. Paying a living wage would help to boost the tax take and overcome the present lack of long-term effective demand in the economy. The paper estimates that a continent wide programme would need funding of the order of 500 billion Euros (£400 billion) per year over the next decade.